Royston Robertson is a freelance cartoonist published in Private Eye, The Spectator, Reader’s Digest (US and UK), Prospect and New Statesman, among many others. He has also drawn for many trade publications including the Law Society Gazette, Nursing Standard and ("this week's guest publication ...") Skip Hire Magazine, as well as producing cartoons for greetings cards, books, websites and doing live graphic recording at conferences. 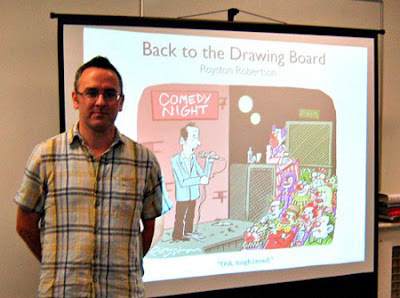 Royston has exhibited cartoons at the Chris Beetles Gallery in London and at the Shrewsbury International Cartoon Festival. He has also been a regular participant in the latter and is a co-organiser of the Herne Bay Cartoon Festival. Born in Catterick, North Yorkshire, in 1968, Royston now lives in Broadstairs, Kent. He has been drawing cartoons for about as long as he can remember. Between school and university, he ran the comic DoodleBug with a group of friends. Part fanzine, part Viz, it built up a strong following in the North East. Royston, second left, was part of a winning team of cartoonists that appeared on the TV quiz show Eggheads and left the show's resident team of quizzers somewhat scrambled. 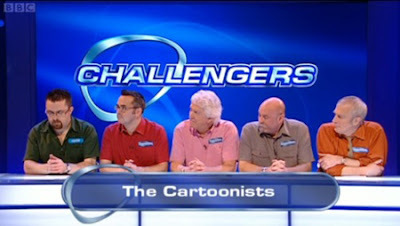 One of the Eggheads called it "the most comprehensive defeat we've ever had".